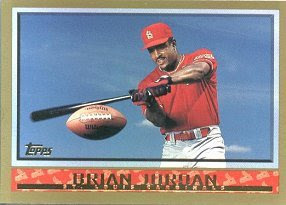 Above is a 1998 Topps Baseball card featuring former Dodger Brian Jordan. He was one of a handful of athletes to have played in both the NFL and MLB. Getting over .500 is the toughest task of all. I just came across this. The Long Beach Armada of the Golden Baseball League has an audio archive of nearly all of their games this year available for download. If you were interested in the games against the Chinese National Baseball Team in May you can listen to them here. A New York Times writer shares his 1930's autograph scrapbook and a couple of stories; including being told, “I don’t ever want to see you again,” by Hall of Famer Lefty Grove. Check out Mark Langill's interview of Tommy Lasorda recalling his days at Yankee Stadium at LA Dodger Talk. It's a great listen. Roberto meets Joe Beimel and gets an early peek at his bobblehead. He also finds this great interview of James Loney. 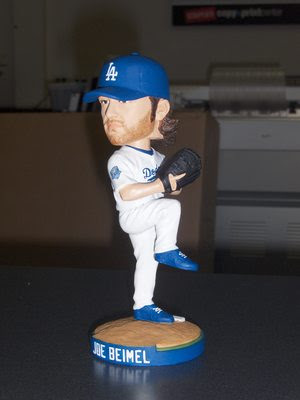 Check out Falling Leaves of Sunshine's Photoblog with plenty of Dodger pics here. Fire Ned Colletti profiles Dodger prospect Jonathon Meloan. "Mr. Mint" Alan Rosen is a little pissed off at the obvious portrayal of him in the upcoming film "Diminished Capacity" featuring Alan Alda and Matthew Broderick. Read about it at The Baseball Card Blog and Infield Dirt. An Indians fan is mourning the loss of their best player, CC Sabathia, by auctioning off, on eBay, his fanatic allegiance and enthusiasm to another team for the rest of the season. He receives some well deserved criticism from the truly faithful in the "Question & Answers" section. Was your rooting interest in the Tribe limitted to watching as little as one game a week and wearing some MLB merchandise as well? If that's the extend to your fandom, haven't current bids already exeeded the value of what you have offered? As an Indians fan who understood the imputus for the trade of CC, good luck with you auction, but once your services are complete, don't bother comimg back to the tee-pee. 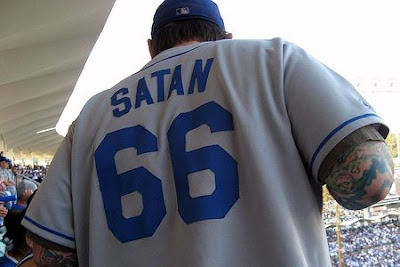 Check out Home Run Derby's jersey of the week. This is a bad omen.